Yes, Virginia...: Simple One Layer with Dies! If you are here for Newtons's Nook Blog Hop, please click here. 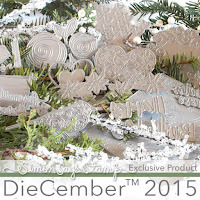 One of the biggest trends for stamp products in 2015 is the abundance of word dies. 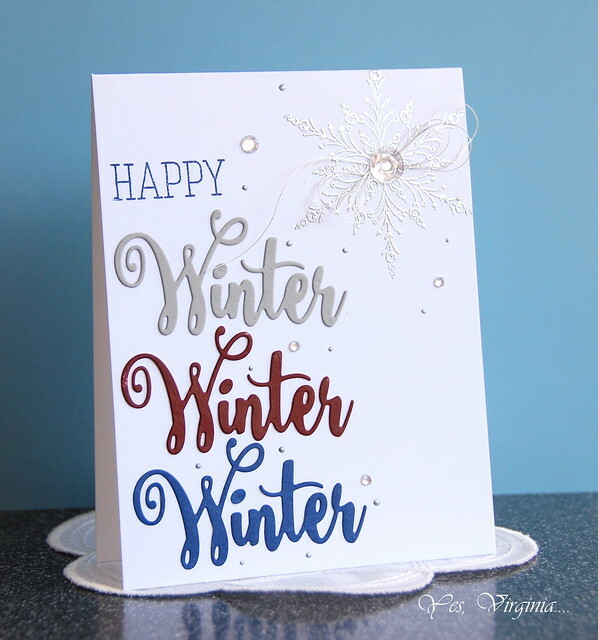 My Happy Winter and Christmas die from Simon Says Stamp did not get much use yet, so I am trying to see how many ways I can maximize it. Today's card is one of the examples. The color scheme for today's card is based on a page that I saw in a fashion magazine. As you may know, the color of 2015 from Pantone is Marsala. 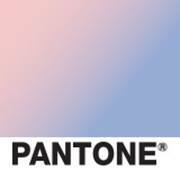 The other day, Pantone just revealed the Color of 2016 is "Rose Quartz and Serenity" (see here). I think the trend reflects a sign of the times as a society. Pantone: "The prevalent combination of Rose Quartz and Serenity also challenges traditional perceptions of color association. In many parts of the world we are experiencing a gender blur as it relates to fashion, which has in turn impacted color trends throughout all other areas of design. This more unilateral approach to color is coinciding with societal movements toward gender equality and fluidity, the consumer's increased comfort with using color as a form of expression, a generation that has less concern about being typecast or judged and an open exchange of digital information that has opened our eyes to different approaches to color usage. " It is this deep, rich, subtle, dark, reddish burgundy. I tried to incorporate it into the card. In order to ensure the colors match my vision, I used the Direct Ink to Paper approach. Namely, you choose the ink pads and swipe them all on white card stock to create your color paper. And then you can make the die cut however you want it. I did, however, used the Zig Markers to color the grey. As for the snowflake? I embossed the image "Soft Grace" from Penny Black in Platinum Embossing Powder. I also added my new addition Grey/Silver Pico Embellisher for that extra something! Simon Says Stamp has come up with 17 more dies! You will see some of them in my new creations soon. For 12 days, you can shop up to 50% off at Craftsy for your favorite hobby. Don't forget, you can also give Craftsy classes & supplies as gifts. Check them out here. The comment feature has been disabled in this post.